(Nanowerk News) These materials, which include metals such as platinum or tantalum, are characterized for being capable of generating a spin current from an electrical current (and viceversa) by means of the so-called spin Hall effect. For this reason, these materials are of outmost importance in the field of spintronics -the branch of science that is devoted to explore the generation, transmission and detection of spin currents in materials and devices. The ultimate goal of spintronics is to have a deeper understanding of the charge-to-spin conversion and transport phenomena at the nanoscale in order to be able to design new functional and efficient devices that are not only based on the injection, transport and storage of electrical charge, but also to its spin, which could revolutionize the conventional electronics and expand its limits. 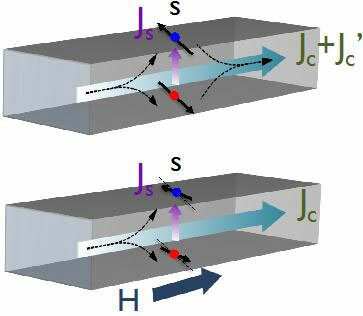 The researchers show that, by means of this novel magnetoresistive effect, it is now possible to study the spin transport properties in these materials without the need to fabricate complex devices and/or involve interfaces between different materials (Physical Review Letters, "Hanle Magnetoresistance in Thin Metal Films with Strong Spin-Orbit Coupling"). Schematic of the direct spin Hall effect (and its inverse) in a thin film of a material with strong spin-orbit coupling. Bottom: schematic of the Hanle magnetoresistance effect when an external magnetic field is applied. When an electric current is applied to a thin film of a material with strong spin-orbit coupling (typically of a few nanometers thick), a spin current is generated in the transverse direction – that is, along the thickness of the film- via the direct spin Hall effect, which in turn produces an electric current (via the inverse spin Hall effect) that adds to the initial applied current. This effect – small since it is due to a second-order correction – causes a reduction in the resistivity of the film, and is maximum when the film thickness is on the order of to the spin diffusion length – that is, the average distance that a spin can travel through the material without suffering a collision that may cause a change in its state. If a magnetic field is applied not collinear to the direction where the spins points to, one can force them to precess, via the so-called Hanle effect, thereby generating a modulation in the resistivity of the material. According to Saul Velez, first author of the work, "this new phenomenon could open ahead the possibility to study the spin transport in materials and systems not yet explored". "This new effect also allows to study the spin transport properties of known materials, and to compare the results with the ones obtained with other techniques or devices", adds Fèlix Casanova, last author and supervisor of the work.